Did You Ever Want to Do More Reading About the Civil War? 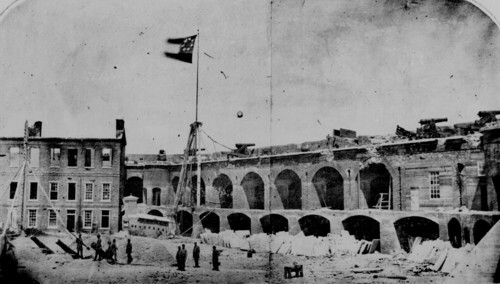 Fort Sumter, SC, 1861, under Confederate flag. And so the Civil War began. Excuse us for living, but never in our lifetime has the topic of the Civil War been so popular as it has this past year. Thanks to Steven Spielberg’s movie, “Lincoln,” and Daniel Day-Lewis’s Academy Award winning portrayal of Abraham Lincoln, the Civil War has seemingly come to life again for many of us. To that, add those who have followed the 150th commemoration of the Battle of Gettysburg this year and it’s been one big historical society meeting! 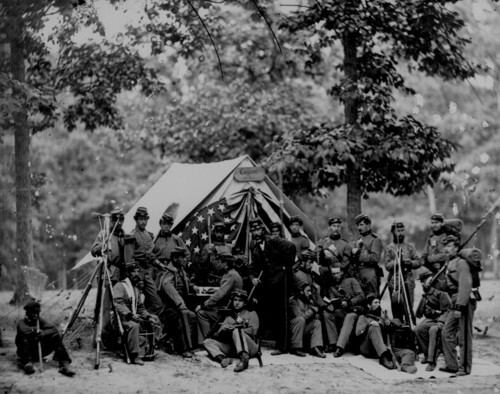 When we say “the Civil War,” not most times, but always, we are referring to our American Civil War, 1861-1865. – – As if there were no other civil wars…the Spanish Civil War, 1936-1939, may readily come to mind as a “modern” example. Or, we could try to analyze the present-day uprisings of the “Arab Spring” as civil wars. – – But let’s not go there! As devastating as our Civil War was with some 620,000 dead, it is a subject that fascinates so many people that we dub them “Civil War buffs.” As a student of American history myself, I had never read extensively on the topic, making my specialty “the social history of industrial America” and into “the Progressive Era.” In my younger years, I naively scoffed at the Civil War as “a bunch of battles,” ignoring the obvious importance between the social, economic, and political developments of Antebellum America and the Civil War itself. 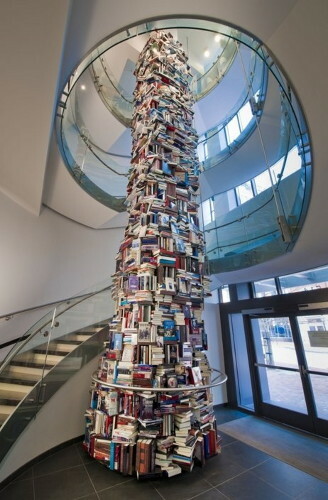 The Tower of Books, 7000 Lincoln books, in the lobby of the newly completed Ford’s Theater Center, Washington, D.C. It is 34 ft. high & 8 ft. around at its base. Needless to say, selecting a few good books about the Civil War was a daunting task. What became very clear, however, as I perused the literature on the Civil War, was that if you were to read only one book on the Civil War, that book would be Battle Cry of Freedom, 1988, by James M. McPherson. In just shy of 900 pages in this Pulitzer Prize winning book, James McPherson, Professor of History Emeritus, Princeton University, quickly teaches you that the Civil War IS NOT “just about a bunch of battles.” He thoroughly explains the social, economic, and political events leading up to the war. Then McPherson leads the reader through a fast-paced narrative of the military battles and details, the names of which are familiar to many of us. By the time the author reaches Appomattox, the reader knows why! 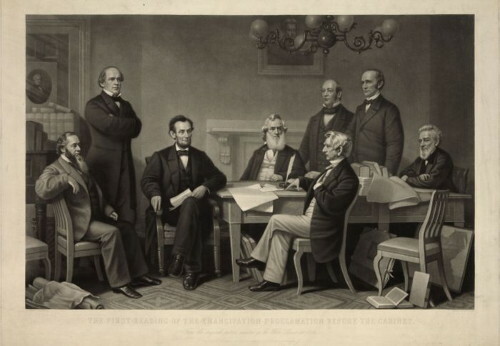 “First Reading of the Emancipation Proclamation Before the Cabinet,” by artist Francis B. Carpenter, completed 1864. Next, I would recommend the book Steven Spielberg’s movie, “Lincoln,” was based upon; Team of Rivals, 2005, by popular historian, Doris Kearns Goodwin. – – another fabulous read pushing 800 pages. Ironically, the book spends all of one and one-half pages on the Thirteenth Amendment, Abolition of Slavery, about which the movie is all about. However, the color and feel, not to mention details of the movie, come from Doris Kearns Goodwin’s book: the cast of characters, many having competed with Lincoln for the Republican nomination for President in the election of 1860, surprisingly selected by Lincoln to serve in his Cabinet; Mary Todd Lincoln and her sons Robert, Todd, and Eddie; and of course, Abraham Lincoln himself. 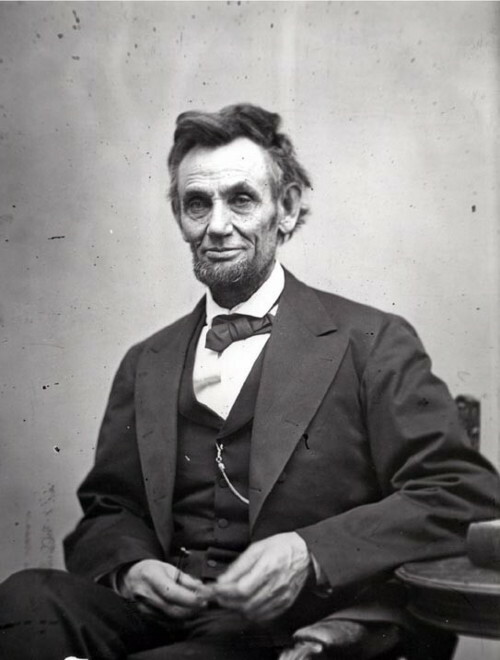 Abraham Lincoln, photographed February 5, 1865, by Alexander Gardner, portrays the weariness of four years of war. Choosing a biography on Abraham Lincoln, as opposed to the entire war, from 7000+ titles, was not as difficult a task as it might seem. Perusing various Lincoln biographies as well as books on the Civil War, one book and name came up again and again in the bibliographies and footnotes; David Herbert Donald’s Lincoln, 1995. Twice won Pulitzer Prize winner for biography, author of numerous books on the Civil War and its cast of characters, David Herbert Donald is Professor Emeritus of American History, Harvard University. And he “does Lincoln” in just under 600 pages…not bad! Donald’s Lincoln is aptly described as a “beautiful rendered and stunningly original portrait” of our sixteenth President. He is able to do so to a great extent by using Lincoln’s personal papers and records of his legal practice. The author explains how Lincoln’s personal and public lives adversely affect each other. He brings this inexperienced, ill- prepared man from obscurity to political success and moral greatness. 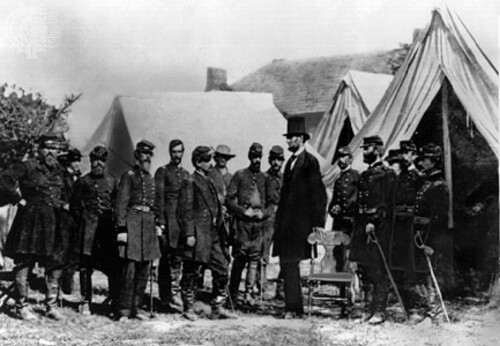 Lincoln & General McClellan with other Union officers on the Antietam battlefield, Maryland, 1862. It was the bloodiest one day battle in American history. 23,000 soldiers were killed, wounded, or missing after 12 hours of savage combat, September 17, 1862. Finally, if you have the time, you must add to your reading list, coming in at a mere 270 pages (! ), another book by James M. McPherson, Tried By War, 2008. This little book is truly well-deserved dessert to complete anyone’s foray into the subject of the Civil War. McPherson portrays Lincoln as our first and greatest Commander-in-Chief; overseeing strategy, planning major engagements with the Confederate army, overstepping rights such as habeas corpus, all in the name of preserving the Union. One is impressed by Lincoln’s trips and visits to the battle front. And, one is frustrated by Lincoln’s seeming inability to goad his reluctant generals into action. The author brings the reader to the verge of screaming at General George McClellan, as Commander of the Army of the Potomac. McClellan fails to advance with one excuse after another. He brings Lincoln to the characterization of him with the amusing words, “He has the slows,” until he is dismissed of his command. McPherson credits Lincoln with molding public opinion and moving the people from preserving the Union to ending slavery itself. 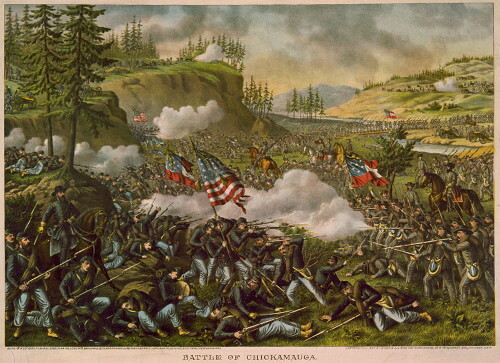 Painting, “Battle of Chickamauga.” The battle took place in 1863, bordering Tennessee & Georgia. Unable to find the artist’s name, but attributed as a lithograph by Kurz & Allison, 1890. Excuse us for living, but we never complete our education. We finish school and then we really begin to read and learn. “Never let your schooling interfere with your education,” said Mark Twain. And now I am a little better versed on a monumental chapter in our American history, the Civil War. Sources: All of the above books, plus a little Google this & Wikipedia that! The war itself was appalling enough, given the genuinely trivial manner in which it was initiated, but what is most disturbing to me is that during the five years of incendiary rhetoric leading up to the war, political leaders on both sides saw the possibility of war as a grand historic adventure (read grandiose). Both sides seemingly convinced that the war would provide a brief but exhilarating side bar to the history of the inevitable conquest of the continent by ascendant white Europeans, which would last no more than a few months, and end in one side or the other, or more likely both sides, claiming historic justification for their actions, and reaching workable accommodations. Virtually every statesman involved in creating the climate for war (including Lincoln) seemed to consider embarking on war to be a moral imperative necessary to imprint the efficacy of their cause onto history, never mind the human and economic costs. What is equally disturbing is that we see the same rhetoric coming from our politicians today, particularly so regarding the Hard Right. Virtually no one, with a few exceptions whose names have been obscured by subsequent events, saw the potential for war for what it was: a grim opportunity to wage the first internecine industrial war empowered by the might of mass produced weapons, and amplified by newly developed rapid heavy lift and transport capability, i.e. railroads and the efficient use of canals. Additionally, the more learned among the congress and the senate were well aware of the fact that historically, civil wars were and are the most brutal (Syria), but that did not seemed to impress the south, with their ridiculously overblown sense of personal honor projected into and onto their native states, and their counter-Christian insistence that slavery was a form of benevolent stewardship over a mongrel subhuman race. Governmentally the civil war was a great example of the codification of dueling schools of institutional hysteria, wherein the rational was submerged in the rhetorically irrational. Lastly, the south entered into the war to preserve slavery, and the north (in my opinion) entered into the war to prevent falling prey to exploitive agriculture, and also, by the way, to free those darned pesky slaves. 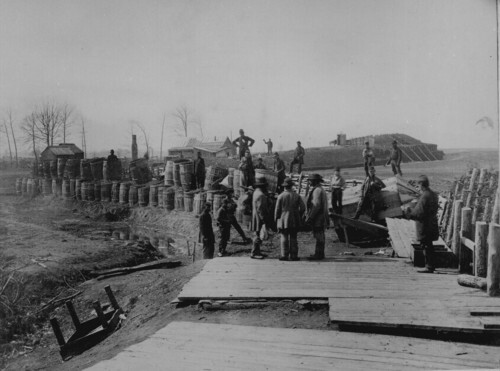 And what is truly appalling is that from the very day the papers were signed at Appomattox, the south began retooling its pre-war narrative to fit the fantasy of the war as a war for states’ rights: The creation of a retro-historical narrative centered on self-determinism, rather than exploitive inhumanity and mercantile cruelty. We see the same today. I cite the successful push for new voter i.d. laws, and the fact that Mississippi did not ratify the emancipation proclamation until 1995. This was very interesting to read. I love to read about history, because I am convinced we can learn a lot from it. I will definitely check out a couple of those books you mentioned! And I certainly will read more about Lincoln, he fascinates me. When I saw this topic was about the Civil War and Lincoln I had to throw my 2 cents in. The Civil War is what got me interested in history. When I was still in junior high, I wanted to be a history teacher. Then I found out how much money teachers made and knew that being a teacher would not let me get out of my lower-class upbringing.